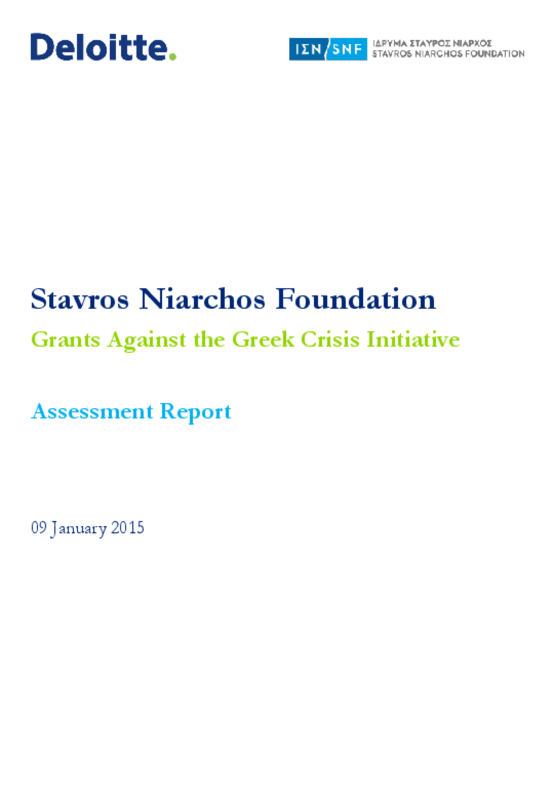 The Stavros Niarchos Foundation's Grants Against the Greek Crisis is a EUR 100 mil., three-year initiative, which started in January 2012. The Initiative's goal was to alleviate society from the severe consequences of the financial crisis in Greece and to assist those most in need to navigate through these difficult circumstances in the less painful way possible. This report measures the impact of the Grants Against the Greek Crisis initiative, which aimed to cover different needs and target various vulnerable groups. The majority of the grants were directed towards combating social exclusion, supporting overburdened households and providing food aid to unprivileged societal groups and areas. Equally important, the initiative offered employment services, provided temporrary accommodation and housing, provided relief and healthcare services and supported the preservation of health standards. The interrelation of the above was seen as an opportunity to develop programs and direct funding into services that could collectively address multiple needs. Copyright 2015 Deloitte, Stavros Niarchos Foundation.